Mohamed Salah fever has swept Britain since his arrival with Liverpool’s goal machine earning two players awards and now a pair of his boots are to sit alongside Egyptian artefacts at the British Museum. 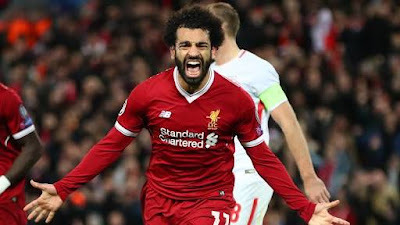 The 25-year-old Egyptian — who set a new Premier League scoring record last season with 32 — will have his boots on display in arguably the finest ancient Egytian collection outside of the country itself. The donation — by adidas — is to celebrate Salah’s winning the Premier League Golden Boot. “This acquisition brings the British Museum’s world-famous Egyptian collection right up to date,” purred Neal Spencer, the British Museum’s Keeper of Ancient Egypt and Sudan. Salah is not finished yet, though, as he heads to the Champions League final on Saturday week in Kiev against holders Real Madrid and thence to Russia leading Egypt’s line in their first World Cup appearance in 28 years. “This acquisition builds on our recent project to acquire objects to tell the story of day-to-day life in 20th and 21st century Egypt,” said Spencer. The boots will go on display next week in the run up to the Champions league final and will be displayed next to footwear from ancient Egypt and adjacent to a selection of gold pharaonic jewellery. In 2016, the British Museum launched its Modern Egypt Project to bolster its collection of contemporary material from modern Egypt.